You want to search one of multiple CRM instances based on queue name. However, you can use another pattern if you wish by changing the RegEx in Dynamics Telephony Settings > Provider Configuration: DNIS RegEx. Dynamics Telephony will parse the queue-name, set up in above section, to a DNIS in Dynamics Telephony. DNIS stands for Dialed Number Identification Service. So it identifies the destination the caller reached. The queue in this case. Set up a DNIS in Dynamics Telephony with the same DNIS and Label as the queue-name (case sensitive), as shown below. – The inbound call dialog will show the DNIS name when a call arrives via that queue. You can also have a per-DNIS color and logo. 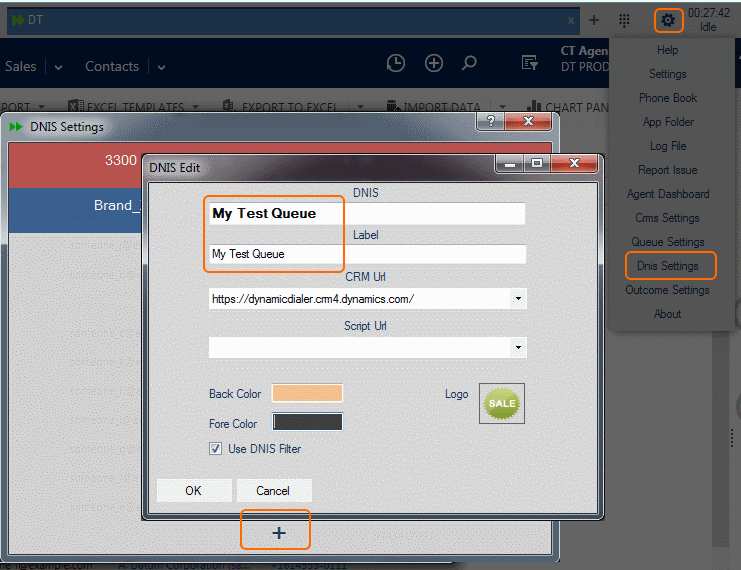 – You can direct the CRM search on inbound call to a particular CRM by picking from the list in the DNIS configuration.